To highlight small businesses and further champion the cause of the small business economy, theÂ White House dispatched Senior Advisor Valerie Jarrett to a pair of small businesses in Chicago on Small Business Saturday. After her visits, she talked to BlackEnterprise.com via phone and, for all of her level-headed, timely counsel to the leader of the free world, Ms. Jarrett had equally balanced advice for young, black entrepreneurs. She talks about the president values relating entrepreneurship, and what small business she’d have if she’d taken a different path. BlackEnterprise.com: You went to two small businesses in Chicago today, what did you see that gives you hope for the small business economy in our country? 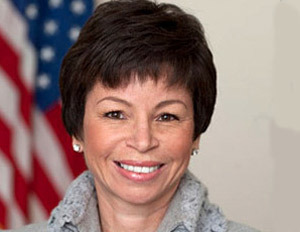 Valerie Jarrett: Well that’s a really good question. I visited two small businesses in the same community in which I grew up. One is a relatively new business and one has been here since I was a child. Little Black Pearl is a wonderful business because part of what the owner does is bring in young people and students and teaches them how to blow glass. So they’re creating and selling their artwork. There’s an opportunity for young musicians to come in and play music and for people in the community to stop by and listen to these young, talented people. It gives them the opportunity to rehearse in front of a crowd. There’s a small cafeteria and she brings in well-known artists who people in the neighborhood might not ordinarily get a chance to meet or to hear. It’s a gathering place in the community — it’s a real anchor in our neighborhood. I think part of it that gives me hope is to see someone who is young and talented who has an idea [for a] business that’s also intended to help improve the quality of life for the people who live in the community. I think you see that across the country at small businesses. They really are the backbone of our communities. They provide the summer and part-time jobs to young people who are in high school. All of the non-profits in the community that help enrich the fabric of the community are supported by small businesses. The second business I visited was Powell’s Bookstore, which has been there since I was a child. It’s a collection of used books, as well as new books. The owner told me today when the president’s Dreams From My Father came out, he bought 4,000 copies of it. His timing was really good because it was right before the president hit the national stage and he kept saying to people, ‘This is an extraordinary young man, trust me, buy this book!’ And then after he gave the speech at the convention, obviously they sold like hot cakes. So he has this kind of oral history that he can tell that’s also part of enriching the community, that he believed in this young guy that he met twenty years ago and now he’s President of the United States. No doubt you will talk to the president at some point about your visit. What do you think he’ll want to know and what will you want to be sure that he knows about what you witnessed? And what stands out to you about what his values are related to the dignity of small business owners? Well he knows that they’re the economic engine of our country, and oftentimes they enrich the fabric of our community because of their dedication. So he believes in supporting small businesses. The Small Business Administration has worked for the last four years of the president’s first term to foster and help small businesses grow and add jobs. The president and I live in the same neighborhood in Chicago and he knows both of the business owners who I visited. So I think he’s going to want to hear about the two of them and how they’re doing and how their businesses are doing, because I think you feel a connection with small businesses in a way that you can’t with a big-box retailer that’s five miles away. I’ve watched these people my entire life. Last year, I also visited two small businesses and one of them was literally the woman who owned the business since I was a child. The other had been around as far as I can remember. You feel a sense of common history with small business owners because so many of them have been in communities for decades. But coming out of this tough economic climate, the president is very concerned about the viability of small businesses. So part of what we want to do with Small Business Saturday is to highlight their importance so that people will support them. Because if people come in on Saturday in the holiday season and they wouldn’t ordinarily have stopped by that small business, it can make the difference between that small business staying open or having to close. So we want to do everything we can throughout the year to help small business strive and grow, but on this particular day we wanted to celebrate and highlight their importance, encouraging everybody to support them the way small businesses support us throughout the year. Can you speak specifically on the small business community in Chicago? I’ve written in the past that Chicago has a robust African-American business community — I’m sure you agree, but how do you articulate and contextualize that for people that don’t live there? Now, I’m biased, obviously because I’m from Chicago. But I think the small businesses that we have in the city are very committed to improving the communities in which they are located. It’s more than just a business, it’s a way of life, it’s a set of values. They are robust and so many of the successful large companies that we’ve had in the African American community started as small businesses. If you think of somebody like John Johnson, he started his business with $500 from his mother and now it’s Johnson Publishing. The same is true of George Johnson with Johnson Products. It started as just a very tiny business, then it grew and flourished. Same thing with SoftSheen. I think it is a city with a rich history of having small businesses become robust. Many McDonald’s franchisees began in Chicago because McDonald’s is headquartered in the suburbs here. They are the ones who started here with one store financed with the help of a family member or a friend and now have multiple franchises and are national franchisees. So I think we are a city that has historically had small businesses that grew to scale and were very, very successful, but whose owners never forgot the community that gave them their start. That sense of responsibility to give back is embedded in Chicago. It’s part of what makes Chicago a vibrant city. The notion of viability for small businesses will keep coming up again and again as we get closer to the Affordable Care Act beginning to take effect. How do you hammer home the president’s message on the legislation, perhaps for businesses who are worried about being able to afford coverage? Well, the Affordable Care Act should make it easier for small businesses to thrive. If they’re below a certain threshold they’re not required to provide health insurance. The goal is to make sure people can participate in exchanges that will provide affordable health care. The Affordable Care Act also provides a tax credit that helps small businesses provide health care insurance. Oftentimes, owners of small businesses want to provide health insurance to their employees, but they simply can’t afford it. They’re choosing between hiring that extra employee or providing health insurance, and now under the Affordable Care Act they get a tax credit which will help them afford health insurance. So the Affordable Care Act should be helpful to small businesses, not hurtful. We want them to thrive and we also want their employees to be able to have access to affordable, high quality health insurance. We think the Affordable Care Act accomplishes both. I personally talk to young African American entrepreneurs every day who want success more than anything and strive for it daily. What’s yours and the White House’s message to those hungry young entrepreneurs striving to make it? And had you taken a path toward owning a small business, what might it be? Well I’ll start on your second part first, which is never give up on your dreams. Dreams are often not easy to materialize. You have to be persistent and determined and you have to be able to take rejection, but keep right on trying. The characteristics I’ve seen in small businesses that are successful were where the owners wouldn’t give up. You just have to have that gut sense that your idea is a good idea and trust your instincts and follow that dream relentlessly. I know a lot of people that start off and when the going gets tough they give up. You can’t give up on your dreams, you have to stay committed to them. I’ve always wanted to have a restaurant. I thought it would be very cool to have a restaurant in the neighborhood where I live so all my friends and family could come. I love to cook. I thought it would just be a lovely experience that I could share with my neighborhood. And who knows? Maybe one day I’ll have that restaurant. Since I was very young child I thought it would be fun to have a restaurant. I took a different course and I’ve never regretted that I didn’t pursue that dream, but I can tell you I recall very vividly that that’s the one thing I always wanted to do, so maybe one day I will. But I think that all too often we give up on our dreams prematurely. So I encourage everybody to never give up on your dream. For those small business ideas that people have — there’s nothing more frustrating than when you have an idea – then you see somebody else who had the same idea – but the difference is that they pursued it and turned it into a business. And you go, ‘I thought about that, why didn’t I do that?’ So I just encourage people to take that leap of faith. Do your due diligence. Make sure you’re not taking on more risk than you can afford, but believe in yourself. And follow those dreams.